Putting technology to work for water users. The Connections Project is ensuring the future prosperity of our region. The $2 billion Project is the largest irrigation modernisation project in Australia. Funded by the Victorian and Australian governments, the Project will ensure the sustainable future of productive agriculture in northern Victoria. The Project is generating water savings by creating a world leading delivery system that boosts irrigator productivity, helps communities thrive and fosters healthy waterways and wetlands. For our region it’s a significant contributor to job creation and investment. It creates hundreds of jobs for local contractors, designers, manufacturers and other water related industries. Meet the people who lead the GMW Connections Project. The Project Control Group reports to the Minister for Water and the GMW board. The Project Control Group’s role is to drive change, and streamline the decision making process. Together, the PCG is responsible for optimising the benefits that the Connections Project delivers for water users and the region. Project Director Frank Fisseler and GMW Managing Director Pat Lennon are also non-voting members of PCG. 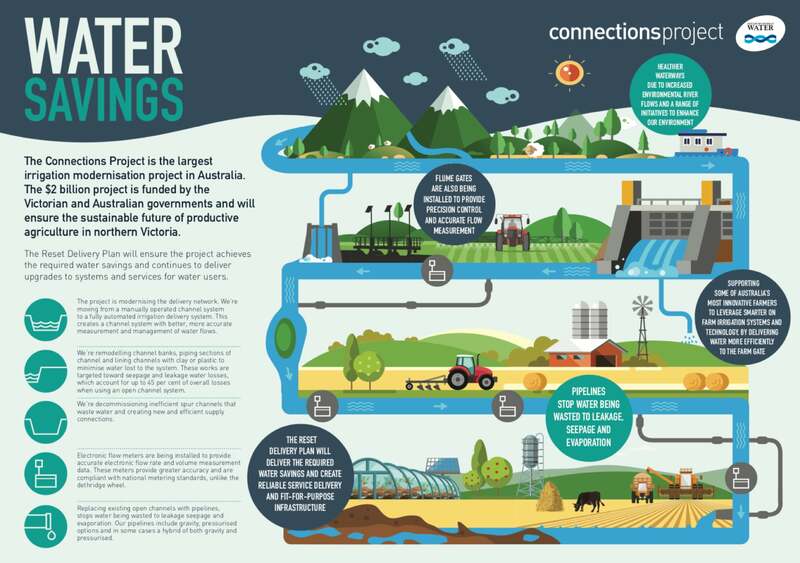 The Connections Project is the largest irrigation modernisation project in Australia. The Victorian and Australian governments are investing more than $2 billion to create a sustainable future for productive agriculture in northern Victoria. Above and beyond this, the Project will ensure the future prosperity of our region and our communities for generations to come. It’s a key part of Victoria’s contribution to the Murray Darling Basin Plan. The water savings are provided to Environmental Water Holders who protect and improve our waterway health to support fish, vegetation and water quality. When the Project is complete – and the channels that waste water through leakage, seepage and evaporation and meters are upgraded or rationalised – it’s estimated an average annual water savings of 429GL will be achieved and irrigation water use efficiency will be increased from about 70 per cent to at least 85 per cent. — The Project is creating a world class irrigation network in the Goulburn-Murray Irrigation District (GMID). — For farming businesses, this means we’re automating water delivery across the region. — Dethridge wheels and manual gate and channel systems are being replaced with automatic systems that allow farmers to get water when and where they need it. — The upgraded system delivers water-use efficiency of 85 per cent or better, maximising the water available for productive agriculture. — The Project is supporting some of Australia’s most innovative farmers to leverage smarter on-farm irrigation systems and technology. — The $2 billion Project is one of the largest infrastructure projects in the country. For the environment, the Project delivers water savings to Environmental Water Holders who protect and improve our water health to support fish, vegetation and water quality. — It’s a significant contributor to job creation and investment in our region. It creates hundreds of jobs for local contractors, designers, manufacturers and other water related industries. — More than this, ensuring the future of our farming businesses, ensures the future of our communities, which were built on region’s agricultural prosperity. — The Project protects our region’s status as a source of high security water, enhancing the sustainability of the entire region. — Importantly it ensures confidence in the agricultural sector in GMID. — For our communities and our region’s future this attracts people and businesses who can invest because they’re reassured about the security of the water delivery network.